Delicata squash, an heirloom variety that’s become super popular over the past decade, has a lot of perks: Not only is it easy to chop but the thin skin is edible and the vegetable is small enough to serve one person. Delicata squash, an heirloom variety that’s become super popular over the past decade, has a lot of perks: Not only is it easy to chop but the thin skin is edible and the vegetable is small enough to serve one person. Here are six ways to make the most of Delicata this season. 1. Soup. End the butternut soup monopoly. Halve Delicata squash lengthwise, seed the halves and bake until they’re soft. Then scoop out the flesh to add to a soup base and puree. 2. Stuffed. 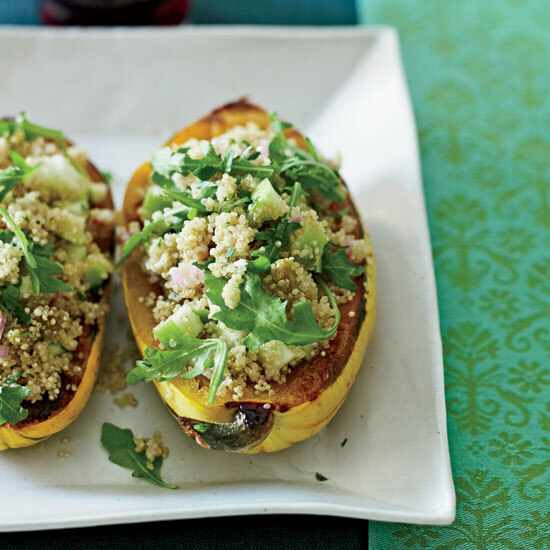 Fill a baked squash half with a grain salad, like this fantastic quinoa studded with raisins, apples and herbs. Eat the skin if you choose. 3. Sliced and roasted. After you halve and seed the squash (don’t worry about peeling it), thinly slice it crosswise. Toss it with olive oil and salt, then spread it out on a baking sheet and roast until tender but crisp. You can eat the slices with your fingers (and call them squash fries) or add the pieces to salads or pasta dishes. 4. Seared. Slice the squash into rings, removing the seeds as you go. Then cook the rings like you would a steak, with a little oil in a hot cast-iron pan. For the best sear and flavor, dry the rings with paper towels and season them well with salt. 5. Pizza. For a lovely autumnal pizza, or this foccaccia, thinly slice the squash (skin and all) and sauté it until tender. Assemble and bake a pizza, then scatter the squash on top and bake the pizza for just one minute longer. (Or just throw the sautéed squash on your frozen or take-out pie. We won’t tell). 6. Hummus. Add the baked squash flesh to your favorite hummus recipe. For the silkiest puree, be sure to add it while it’s still warm.